Wrong, Alex. While the character of Jochanaan IS John the Baptist, the opera in which he appears is most definitely NOT by Richard Wagner. The opera is Salome, which of course is the work of Richard Strauss. Same first name, but the lives of Wagner (1813-1883) and Strauss (1864-1949) barely even overlap. Naturally, the error went unacknowledged by both the contestant and the man who has all the answers, Alex Trebek. All this made me wonder: if John the Baptist were to make a cameo in an opera by Richard Wagner, which one would it be? The obvious choice, I think, would be Parsifal simply because of the biblical subject matter. Or maybe Die Meistersinger? Wait, that’ll never work. It’s awfully difficult to compete in singing contests when you’re missing your head. What about John the Baptist as Lohengrin in LA Opera’s recent production? A knight with a prosthetic leg gets decapitated after telling Elsa his name? Seems like a perfect scenario for our headless hero. 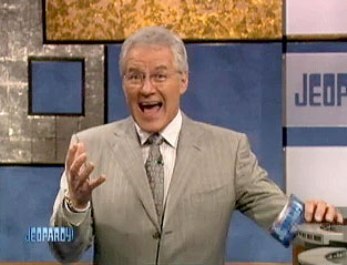 Okay, okay…in the course of hosting 6,300+ episodes of Jeopardy!, mistakes happen and life moves on. 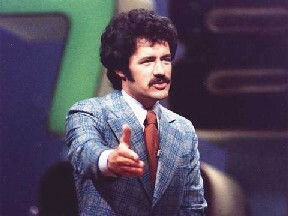 But Alex Trebek knows classical music quite well. Back in the day, he even worked with some of my colleagues at KUSC. (Gail Eichenthal and Rich Capparela, to name a couple.) And this is an easy one–a major opera by a major composer. You’d think he would have caught it. H/T to A Fool in the Forest for inspiring me to video my DVR’ed version of yesterday’s episode of Jeopardy! and write this post. Hi Lynda,Thanks for your very generous cneommts about the work of Susan, Lisa Spector, and myself. What I like the most about this project (now in its 7th year) is the opportunity to work cross-species, to think outside the box about the effect of man-made frequencies on flora and fauna. We all vibrate and therefore sound (and music) has an enormous impact on us all. How to use sound as an ally? This is the beginning of sound awareness! Now we are talkin’! Hope we be listening, as well. The obvious choice is for Jochanaan to appear as a cameo in that very famous Wagner opera about Arthurian and Grail lore, “Gawain,” where he could double as that other famous headless character, the Green Knight. . . . . Wait a minute, maybe that wasn’t by Wagner, but rather someone with a B-name: Bach, Birtwistle, Brahms . . . . yeah, one of those guys. That’s the ticket. I get Birtwistle and Wagner confused all the time. I was somewhat wroried about the lack of granola activity on the show this week. I thought maybe there was a problem with the uploaded file for a few hours Hopefully it’ll be just a quick heart /double /triple/etc bypass and Alex will be up and about asking answers again in no time.